Amicus Productions, basically a lower-budget Hammer Studios, acquired the rights, and produced Dr Who & the Daleks, starring Peter Cushing as Doctor Who. The TARDIS, while still a space-time travelling device bigger on the inside than the outside, is now the product of one man's expertise, not the culmination of the technology of an advanced civilization. 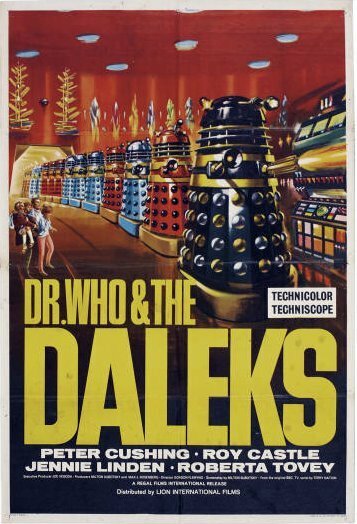 Encouraged by the ticket sales, Amicus adapted the second Dalek story into an even more-expensive feature film, Daleks Invasion Earth: 2150 AD. And, you can watch the ENTIRE MOVIE HERE!